Recently, I began decorating the main hallway to the entrance of our home. This hallway connects all of the major rooms in the house and is pretty much the first thing you see as you walk in the front door. I wanted this space to be a representation of our family and everything important in our lives. Since my wedding day was one of the best days of my life and marked the beginning of our family, I wanted to commemorate one of my favorite wedding photos on a personalized wall clock. Luckily, I discovered For All Time Clocks. This company makes the most unique wall clocks because they will personalize the face of the clock any way you want! Once I saw some samples of their work online, I was sold. Thankfully, they allowed me to review a personalized design 12" wall clock. Keep reading to see how it turned out! 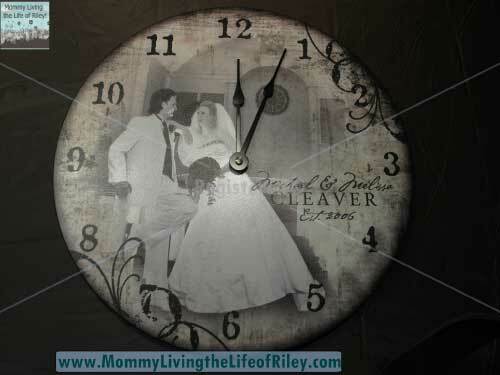 I received a Personalized Design 12" Clock from For All Time Clocks, which retails for $80.00. ORDER BY DECEMBER 1ST TO ENSURE HOLIDAY DELIVERY! 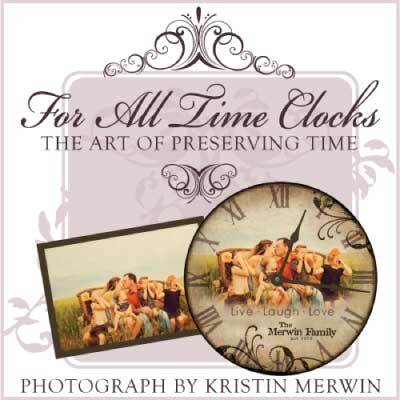 With For All Time Clocks, you can turn your favorite photo into a treasured family heirloom. They have a wide variety of stunning designs which will compliment any photo you choose and transform it into a timeless work of art. Personally, I immediately fell in love with background sample #22, and so I combed my photo albums, both online and off, to try and find a picture which would symbolize our family for years to come. 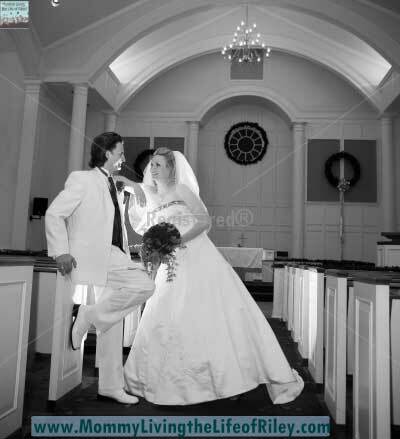 I finally decided to use a photo taken at our wedding. It's one of my favorite pictures because it was taken immediately after Michael and I were married and you can easily see the joy in both of our faces. Every time I look at this picture, I'm reminded of two crazy kids who are just beginning their lives together and who can't wait to get started! This picture definitely represents the beginning of the Cleaver family and one that I know we'll always cherish! What came next was extremely simple. I emailed this picture to the designers at For All Time Clocks and told them that I liked the #22 sample design. They created a proof of my clock and emailed it to me for my approval. I had a few small changes that I wanted made and within a day or two, my custom clock was designed EXACTLY like I had envisioned! The wall clock took about two weeks to make and then it was shipped to me. My mouth literally dropped open when I saw what they had designed! I couldn't believe how wonderful this clock looked! Even though I already knew what it would look like, I was amazed at the actual results. This wall clock was absolutely PERFECT and it would be impossible for this company to have done a better job! If you want to give an extremely unique holiday, anniversary, birthday or graduation present which will be cherished for a lifetime, then I highly recommend creating a personalized design wall clock at For All Time Clocks. I guarantee that you will love the results as well as make someone special very happy this holiday season! Disclosure: I received a personalized design 12" clock from For All Time Clocks in order to facilitate my review. No other compensation was received. This product review is based on my own personal experiences with this item and is completely honest and objective.